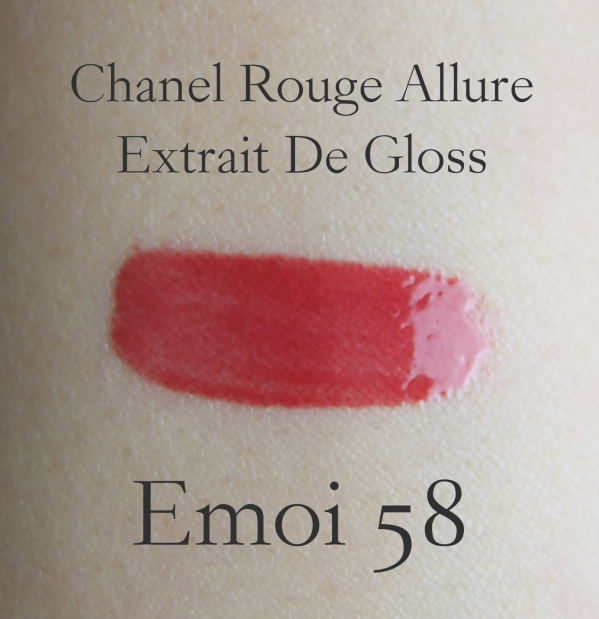 Chanel Rouge Allure Extrait De Gloss Émoi is one of the recently acquired "off red" lippies. And I believe I have been wearing this most frequently, too. I love the packaging designs of Chanel Rouge Allure line. 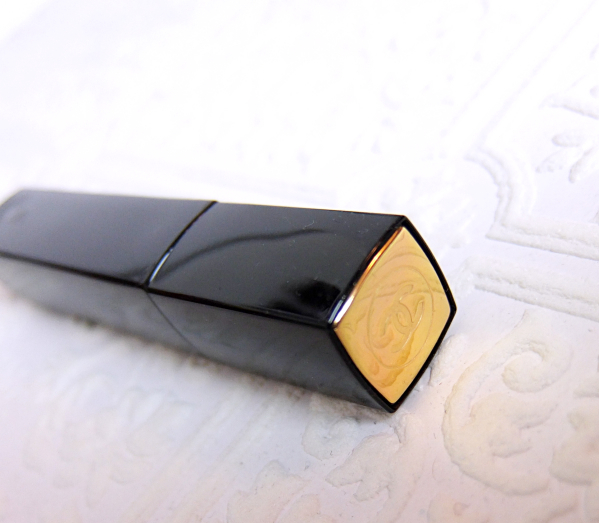 The slick black tube with golden top is simply gorgeous. The tube is made of weighty ceramic, which feels even more luxurious. Émoi is a berry red with fine gold shimmer. 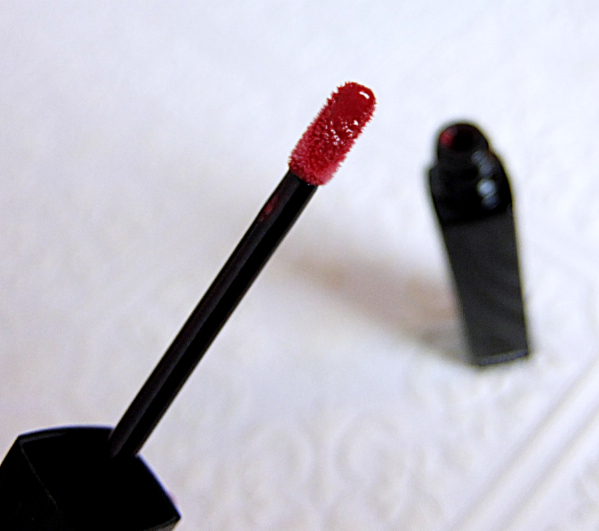 The applicator feels flexible enough and suits the lip gloss formula very well. 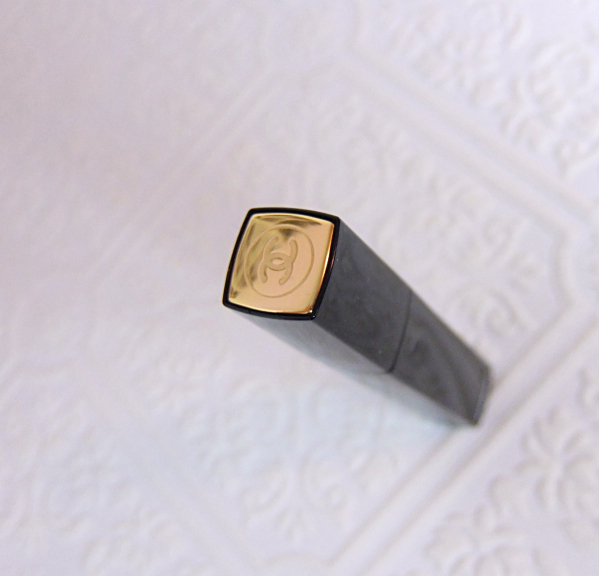 Both sides of the tip are flat, which helps the color to adhere better on the lips. Émoi is another complex red that has multi-undertones. It is blue-based but still manages to look warm and blushed thanks to the micro shimmer that only adds dimension and warmth. 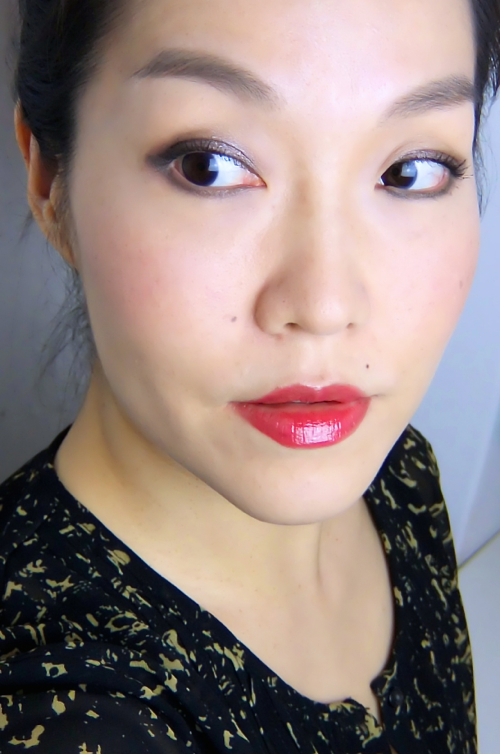 This lip swatch is made with a few swipes. For a lip gloss, it is quite pigmented and the color goes on evenly. The formula comes with a slightly tacky feel. If you cannot stand any sticky lip gloss, you probably won't like it. However, the tackiness is just about right maybe due to its gel-like consistency, if that makes any sense. It stays on me for about 3 hours and fades evenly down to a light stain. It does not peel my lips nor form those icky white lines, so reapplication is a breeze. There is the faint smell same as the Rouge Allure Lipsticks. I do not particularly care for it but I'm not bothered by it, either. Chanel Rouge Allure Extrait De Gloss gets a solid A from me. And the color Émoi has totally won my heart. It is such a lady-like red that still looks youthful. 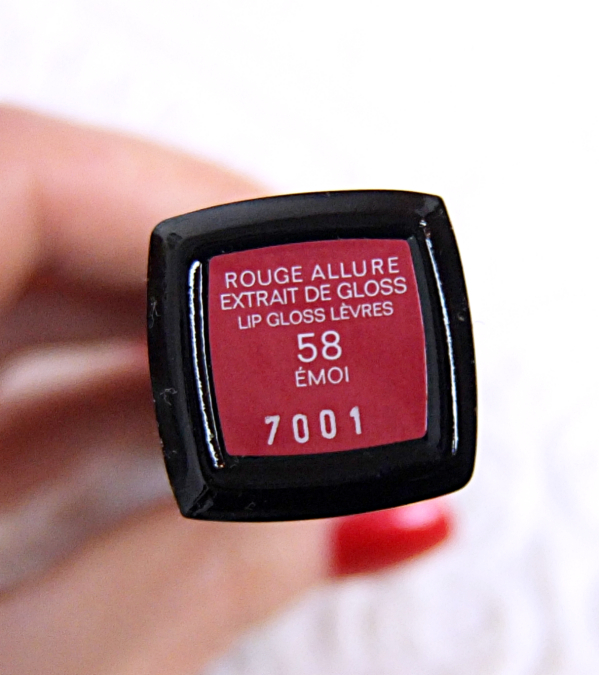 You can still find Rouge Allure Extrait De Gloss but it will be replaced by the new Rouge Allure Gloss. It seems soon I will be forking over a few more dollars for the new click-y tube. So pretty on you Lena! I hear ya about Chanel and that's why I don't have a lot of their products. I find them kind of meh for the price. But I do love my Chanel Le Beiges powder! I use that one a lot. But that's about it. I want Les Beiges, too! Unfortunately, even the lightest colors looks a bit too dark and pink for me to use for touch-ups. I bought a dc'd pressed powder not too long ago, and I'm pleased with that one, however. I like this color a lot, too. Oh dear! I didn't know that the old packaging was being replaced! I thought the Rouge Allure was a new addition! Love this colour on you and I like the off-red; a very good introduction to bolder red for the faint-hearted! I haven't tried much of CHANEL's lip products, though their complexion products are must-haves for me! Have you tried them? That is such a solid and gorgeous color! I'd typically go for pink/berry toned glosses but this really goes well with your pale complexion! I've yet to try any chanel lipglosses but I would love a lipstick from them first! I've seen Émoi pulling more berry on some people, too. I guess that is the beauty of wearing lip gloss. Your natural undertone plays a quite a bit. Hi Sunny, thanks! I like this color a lot. Maybe even more than I anticipated. i'm sort of like you in that chanel lip pies don't really seem to register for me. even with the packing and the colors. not sure why. but the few reviews i've read on this gloss actually makes me curious to try. the gel formula sounds pretty nice even with the tackiness which i don't mind. I cannot say they are terrible since I still use them quite often. It's just that I want something better, you know? For example, Dior makes really good ones if in the same price range. Yes, I agree with you! I cannot wear something too sticky like glue but I don't mind some good tackiness. As long as I can smack my lips and separate them back (does that even make sense? LOL)! And color has to set in to stay on, so I prefer slightly sticky over slippery. I still see these from the retailers but not many colors like there used to. You might want to wait until you see the new ones in the store. Chanel lipsticks/lip glosses rarely pull me in. I don't know why that is...probably because I am a Dior girl at heart :) I love this color on you, though! MORE RED, LENA. MORE RED. Who doesn't get sucked in by Chanel's beautiful packaging XD You rock this color Lena! Bummer the regular version of the Manga was a letdown for you. Hope you'll like the WP version better. And thanks, Rowena. I wasn't sure how much I'd like this gloss since I never liked Glossimers. Oh I love this one on you! The color suits you so well, and I just love how super super glossy it is. I'm a sucker for Chanel packaging too -- I have one of the Rouge Allure lipsticks and now I really want one of these! This is such a beautiful sheer red on you. Eek, I'm not really a fan of the click type glosses. Well I'm not huge on glosses in general. I say that as I have a basket full of glosses haha. I've been reducing in terms of my gloss stash as I've grown to like sheer lipsticks and stain products more.